Whether you are interested in analogue organs, digital organs or PC organs, we can help you. A console should conform to standard dimensions so that organists feel at home playing different instruments. We have standard dimensions recommended by the Royal College of Organists and the American Guild of Organists. Members have built their own consoles or converted existing ones, and can provide advice. An electronic organ has a switch for every key, stop and piston. We have designs for switches using metal contacts, Hall effect switches, optical switches and reed-switch devices. Wiring diagrams, components and instructions are available for connecting switches to circuits. This project, developed some years ago, is still available to those interested in analogue techniques. It is based on a book written by Dr Colin Pykett, an internationally known author on organ topics. This book is no longer available in hard copy but is available in digital format through the Society* and, along with additional notes produced by the Society, provides all of the circuits and other information needed to make a complete organ. Printed Circuit Boards (PCBs) are available through the Society and most components are available either commercially or through the Society. * Digital copies of this book are only available to Members of the Society and only on receipt of a written assurance that it is for personal use only. For those wishing to make their own PCBs at home, we have a proven process and instruction sheet. To make organs using sound modules or a computer, a console with a MIDI scanner is required. MIDI is an internationally recognised interface for connecting together electronic musical instruments and computers. A MIDI Scanner is a circuit fitted to a console which connects to switches on the keys, pedals, stops, pistons and swell pedals, and provides a MIDI output. 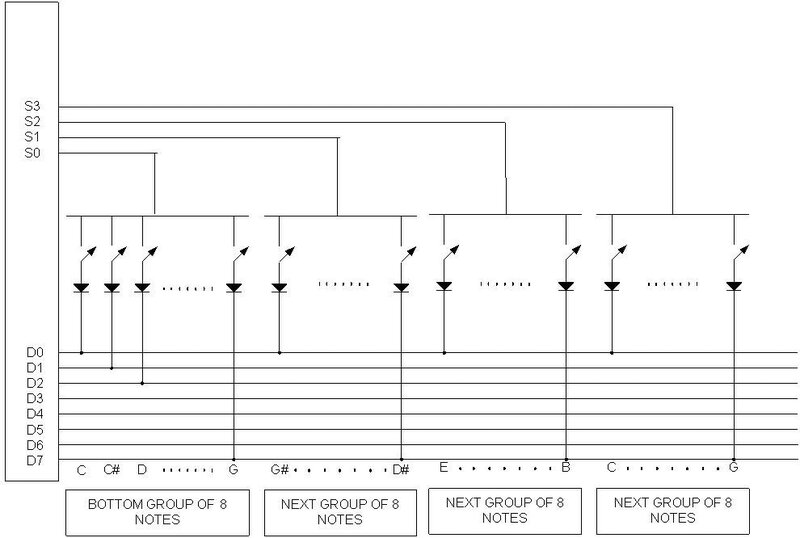 The MIDI output can be used to drive Digital Synthesisers, or PC based organs. We have designs for MIDI scanners available as kits or ready built and tested. The basic scanner can accommodate 3x61 note keyboards, 32 pedals, 128 stops and 41 pistons. A larger scanner is available for 4 manual organs. There is also a scanner for up to 4 swell pedals. The basic keyboard scanner is also available in two variants, one which automatically plays the lowest note on the pedals, and one which is specially programmed to drive the popular theatre organ called Miditzer 216. These scanners provide 5-pin DIN outputs. An interface module is available to convert a 5-pin DIN output to USB, for easy connection to a PC. There is also a MIDI to Parallel converter. 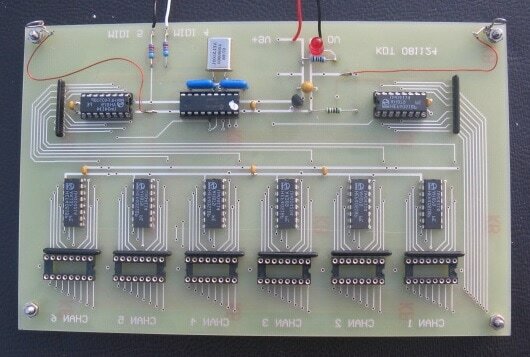 This design accepts MIDI signals, and outputs the corresponding on/off signals on 64 outputs. It can be used to drive illuminated stop-tabs or solenoid drawstops. All these modules are available built and tested, or as kits. They are available to members for much less than the cost of commercial units. If a MIDI signal is available there is a wide range of devices which can be used to produce the sound. Of these, the most popular are PC organs, especially Hauptwerk and Grand Orgue. We have instructions for choosing the right PC for your instrument and loading the software. We also have instructions for building a PC, which can reduce costs. This is backed up with an offer of personal support.